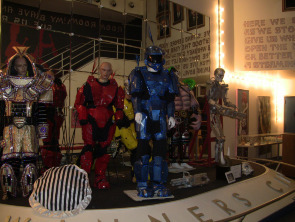 Costume display of The South Philly Vikings, winners of the 2010 Fancy Brigade. Over the past century, a community with complex bonds has emerged in South Philadelphia around an iconic trademark of this city —The Mummers. Through a shared heritage, family links and neighborhood ties, this community has maintained itself as the creators of the longest-running folk parade in the United States. In January 1901, about 2,500 costumed performers strutted up Broad Street to City Hall for the first time. In January 2010, an estimated 10,000 Mummers were suited up for the New Year's parade. Local clubs compete in one of four categories—Comics, Fancies, String Bands and Fancy Brigades. For most Mummers, there are a few, often intertwined, reasons for their involvement. First and most important, it’s fun. The heart of the Mummers lies with performance. “It’s entertaining. You celebrate, you dance, you play,” said Shane Lutz. He has been a performer in the Comic division for the last twelve years. A third motivation for joining and staying involved is the strong friendships that over time become primary ties. “Whether it’s drinking a beer at the clubs, or traveling for performances, you become absorbed in that environment. 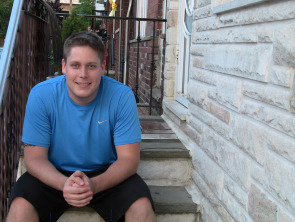 Everybody you know or socialize with is from that Mummers' environment,” said Louis Viola. His became a Mummer when he was a teenager and through his involvement he met his wife, Mary. The Violas have been married for almost 10 years. The Violas' 9-year-old daughter Mia is already carrying out the tradition and became a member of the Fancy Brigade division last year. 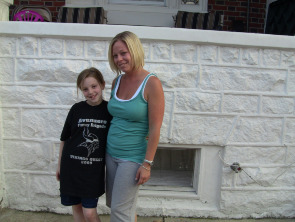 Mary Viola passed the tradition of being a Mummer to her daughter, Mia. The membership dues were established to help with the cost of the New Years Parade. There are 44 major clubs within the four divisions of Philadelphia Mummers and each major club spends about $150,000 to $200,000 for the parade. “The money is spent on suits, choreographers artists for painting the floats, the floats, lights, music, props and other miscellaneous expenses,” said Viola. All clubs have numerous fundraisers during the year and some String Band clubs are able to tour and make money from events. The 2008 budget crisis in Philadelphia caused the city to scale back its financial contribution to the Mummers Parade. The city offered $300,000 for the 2009 parade, but nothing for 2010. The organization, "Save The Mummers," was created to help raise money for the continuation of the parade. “Without Save The Mummers, we would not have be able to sustain ourselves,” said Viola. The Mummers Museum, located on Second and Washington streets, is a non-profit organization that houses Mummer memorabilia and paraphernalia. It opened its doors in 1976 but in recent years has also been struggling to get by. “Truthfully, it’s not the cost of admission that’s keeping people away. It’s the interest that’s declining,” said Palma Lucas, the executive director of the Mummers Museum. According to Lucas, 80 percent of the visitors are from out of town. During the summer months, the museum hosts free Mummers concerts in its parking lot. “We sell refreshments to make money, but our intentions are to keep the local community involved,” said Lucas. Through family emphasis and an active involvement in the community, the Mummers are trying to attract young members. They have continually updated their tradition by including new trends in music and choreography. “I’ll continue to be apart of this as long as I can. It’s a great feeling to be surrounded by friends and family”, said Kruc, a 25-year-old member. Despite economic troubles, the Mummers Parade has shown remarkable resilience and members are fighting to keep their rich heritage alive. Donations for the Mummers can be made to SavetheMummers.com or can be sent to the Mummers Museum. This article was written and reported by Emily Clymer for Philadelphia Neighborhoods, a publication of Temple University's Multimedia Urban Reporting Lab, and originally published on June 4, 2010 .